Advanced Skin Solutions is excited to present this new state of the art technology in South Africa, offering fresh, new options for non-surgical facelifts with virtually no downtime. A traditional surgical facelift deals with both tightening of the deeper layers (SMAS) and the skin. SMAS stands for superficial musculoaponeurotic system and represents the deeper tissues in the face. It is a well recognized fact that the SMAS must be tightened to achieve a tight, natural and long lasting facelift. Some clinics do not routinely treat the SMAS tissues when performing non-surgical facelift options and these types of lifts simply do not last as long as when the SMAS is treated. Therefore a “skin only lift;” may be faster and cheaper, but will not last as long. Some patients will require only superficial skin tightening, while others will require both skin and SMAS tightening. We are happy to offer both. In a nutshell……. 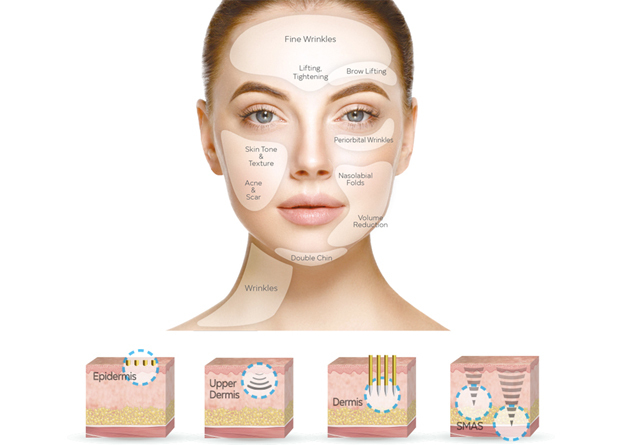 ULTRAcel Q+ will deal with deeper tightening issues in the SMAS while INTRAcel Pro will deal with Epidermal and Dermal skin tightening and rejuvenation.